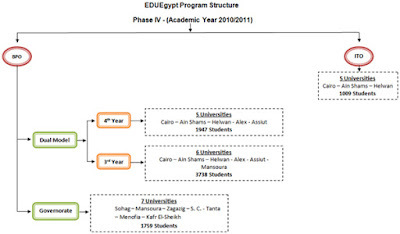 الصفحة الرئيسية Edu Egypt برنامج " EDU Egypt "
برنامج " EDU Egypt "
EDUEgypt's Dual Model is currently being implemented in 5 universities (Ain Shams- Alex.- Assiut- Cairo- Helwan) in the 3rd and 4th academic years:(1) 3rd Year Language Skills Program:The language Skills Program has started in EDUEgypt III with the objective of enhancing the language skills, preparing by this students to join the program in their next academic year. (2) 4th Year Program:The Program works on enhancing the students' Language Skills, Customer Service Skills, Cultural Sensitization, Computer and Data Skills. The program is delivered by Egyptian trainers who were trained by the best Indian experts in the BPO field; IBM and Infosys. EDUEgypt One Year Model targets students in their 4th Academic year. It is currently being implemented in 7 universities ( Mansoura, Zagazig, Sohag, Tanta, Suez Canal, Kafr El-Sheikh and Menofia). Students coverBusiness Skills Training. This year’s training is going to be held by the leading technology and training providers ensuring maximum output and enhanced employability in a problem oriented approach. Total course duration is for 60 hours to be conducted over 10 weeks of training that will be finished in the second semester. Evaluation for the course is going to be based on a mid-term and a final assessment covering both the theory and practice parts.